If the Crystal City BID has brought Synetic to their new home on South Bell Street to give the area some soul, as their spokesperson indicated on opening night, they’ve suceeded mightily. Playing now through October 31, this vivid re-imagining of the famous legend is adapted by Paata Tsikurishvili and Ben Cunis to draw on Celtic myth and previous versions of King Arthur, like John Boorman’s Excaliber, punctuating it anew. 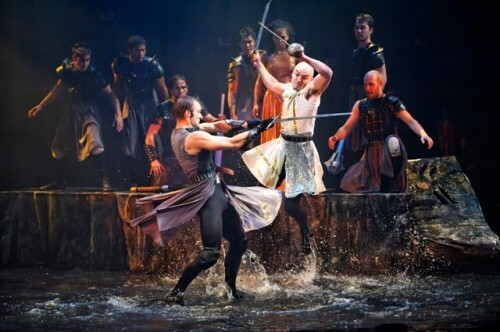 From the first scene, where Merlin (Alex Mills) conjures the sword Excaliber from the mystical lake, the audience is transported to the Dark Ages – flashlights striking the blade and the water. The prelude details the shapeshifting spell of Uther Pendragon that Merlin cast so that Arthur could be born – just as in the Boorman film, but here it is seen through the heartbroken eyes of Morgan le Fay (Jodi Niehoff). Her anguish is the backbone of this production, twisting pain into revenge by shapeshifting herself to sleep with her brother Arthur (Ben Cunis) in a moment of horrible rage and lust. The two half-siblings represent ancient powers and older myths, dark mirrors to each other. Arthur’s reaction to his betrayal by his best friend and his wife is a mirror to his sister’s pain - instead of seeking revenge on them, he sets up his son Mordred as a Lord of Misrule to punish himself , and us all. We know the basic plot of the King Arthur legend, but seeing it delivered with such complex audacity is truly magical. The water element may seem to some a gimic, but it is absolutely essential and echoed in the Celtic myth itself – from the Lady of the Lake to Lancelot of the Lake. Its presence is almost a character itself, as fabric gently swirls it calm or boots kick it up in a fury. When the rain comes, in a scene of total quiet, it’s both mournful and cleansing. 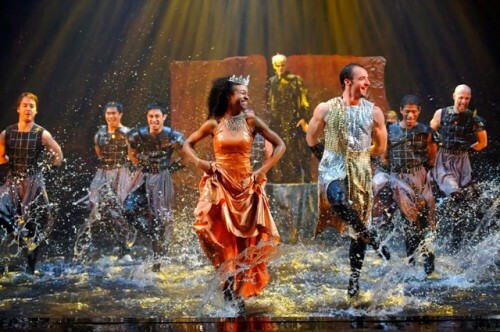 Other images haunt me still – a wall of wounded knights, the creep of slimy monsters, a raucous and uplifting wedding dance that blesses the audience with splashes. Ben Cunis as King Arthur really comes into his own. His muscularity and quiet intelligence perfectly complement a warrior of the Dark Age, a time when power and grace were the same. When his world turns awry his disappointment is palpable, and at his final exit you feel the departure of an era. Vato Tsikurishvili plays Lancelot’s purity not as a prig but as a man burdened with perfection – his relieved smile when Arthur defeats him is that of a child finding a parent. Brynn Tucker’s Guinevere may love and respect Arthur, but she longs for her days as a warrior queen and this is the doomed bond she shares with Lancelot. The motivations of all three are subtly illustrated in a dance of delicacy – watch how each of them relates to the water. Production design is always one of the highlights of Synetic. Water is no easy thing to light effectively, and lighting designer Andrew F. Griffin does a remarkable job playing with both reflection and refraction to highlight the watery world created by Anastasia R. Simes. Her outstanding set design is elegantly simple - a water stage populated by stones – as timeless as the myth itself. You might overlook her costumes while being dazzled by the water, but the two elements are integrated perfectly as fabric flows and drags and tears through water. And flowing over all is the original music by Konstantine Lortkipanidze, rich in modern elements that nonetheless are never a distraction. If you’re familiar with Synetic’s work, you are already excited and planning your night out to Arthur’s watery reign in Avalon. If you haven’t seen them yet, I absolutely wish I could conjure you there. Synetic Theater is located at 1800 South Bell Street, Arlington, VA 22202. Closest Metro stop: Crystal City (Blue/Yellow line). For more information call (800) 494-8497. Thanks for explaining the story. It would have made more sense if I had studied it in advance for this production. For example, near the end I didn’t understand why coal miners were hanging onto the wall–but you explained that they were wounded knights. It certainly was visually spectacular, even if the story was not clear to anyone not immersed in the King Arthur legend. 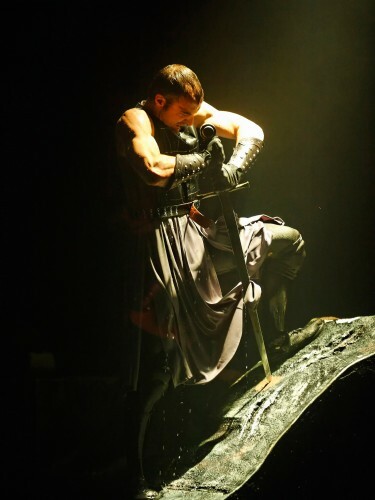 Jenn–I’m so glad you gave this review; I don’t think I would have seen the show otherwise, and I loved it! It was so poignant and raw, and I loved the way they played with the water element.